I had an idea the other day to try my hand at a rolled brisket or corned beef. In the end it turned out very much like pastrami but without the very strong flavour as there was no coating stuck on. I got a standard peice of Scottish Beef from Tesco for my test. I would advise you can buy better than this but £14 for 2.35kg was ok for start off with. The method is very simple…. 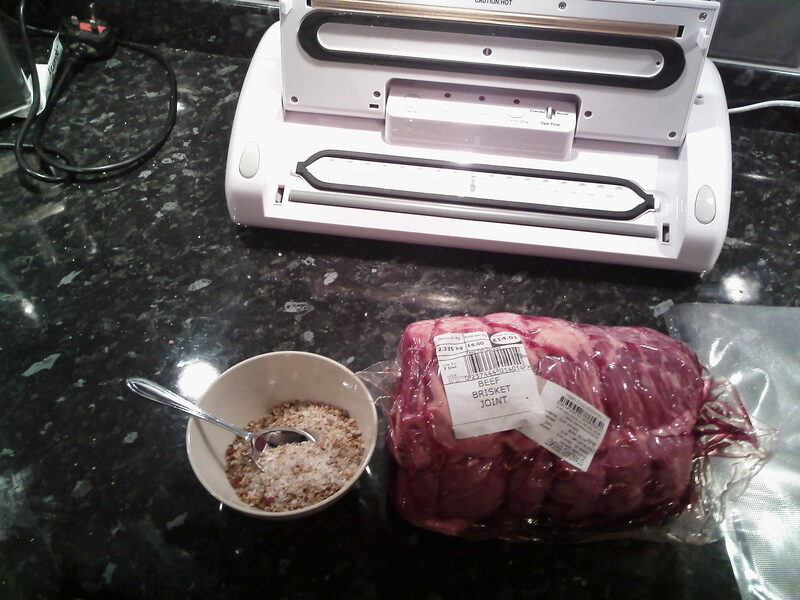 3) Rub on cure (turning over a part of the bag to ensure it stays dry. 7) Turn every day and massage to help flow of salts and flavour. 8) 20th day take off packaging, rinse in cold water thoroughly. Then place in large pot with more picking spice to taste, some dark rum (optional), chopped veg such as carrot, onion, celery,salt water slightly as if for potatoes to keep salt from leeching out and bring to boil. You can salt water as this recipe is really very delicate and is not over salted. In fact I would add a little more maybe 75g of normal s alt and it would be fine on my next effort. 9) Cut in thin slices and leave rest to cool. 10) Optional idea to make it cure more evenly and quicker, unroll and cure, then re-roll before you cook it. Or don’t roll at all like pastrami. Spice mix of your choice, I tried pickle spice but I think actually black pepper, paprika, tom puree, garlic etc.. might be better. Note you must partly crush the spices to help yield flavour. I used a cure called Prague Powder 1 which in fact is Prague powder #1 or pink salt contains 93.75% table salt and 6.25% sodium nitrite. The particular brand I use states clearly that you use at a rate of 2.5g per 1000g of meat. To enable you do this I bought a set of very cheap but highly accurate scales to 1/100th of a gram. I measured the Prague Powder very carefully in a muffin paper case three times to be sure. If you make a mistake you will kill anyone who eats the food. I have done a lot of this and never had an issue but I am very very careful. If you are not sure don’t risk it. If you cannot mange to mix to this level of accuracy I suggest you buy the cure ready mixed. This is often labelled at Bacon Cure and will work the same. If you use the Bacon Cure you can omit the other salt as it is ready mixed. That is normally added at rate of 30g per 1000g so easier to handle. Howdy! You some form of professional? Great message. Are you able to tell me methods to subscribe your weblog? not pro just a person having a go! You are now signed up I think so you can post comments back to my posts. Yes I think it is an English name. We often call the Cure 1 & 2 as well. Try out… http://www.sausagemaking.org/acatalog/Curing_Products.html they are here to look at. I get the pure Nitrate & Nitrate and mix my own. Can anyone tell me how to find corned beef at Tesco- Is it listed as beef brisket? It just states “Corned Beef” on the can, you cannot buy the type of thing I made. You can buy a brisket and cook it for 3 hours and it will be similar. I’ve been following your blog for a while now and have always wanted to make my own salt beef. I recently found while searching on google a pre-mix salt beef cure on Surfy’s Home Curing at http://www.homecuring.co.uk and bought some. The instructions were easy to follow and we cooked our first piece of home cured brisket last weekend. I’ve got to say it’s the best we’ve ever tasted. Can’t wait to try some bacon next. If it wasn’t for your blog we wouldn’t have been inspired to try something like this so please keep it up. That is fantastic, and just why I put on the images as it is hard to know, keep up the good work. I also checked out that site you linked and it has some good stuff. Also you are much better in buying the premix unless you have some 0.01g precision scales. However, if you check on Amazon they are about £10 a set if you get more confident. I also inspired quite a few of our family friends as well!